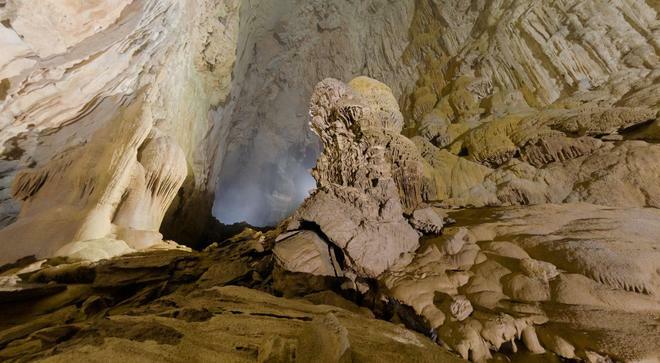 he pristine beauty and grandeur of Son Doong cave. Here are pictures taken from the project posted on Nat Geo. 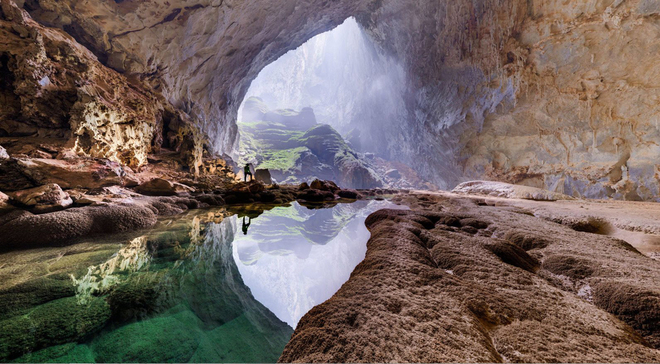 Opening the album 360 degrees reportage is a river guiding to Son Doong cave with the introduction of the world’s largest cave, in the national park of Phong Nha – Ke Bang. It is about 500 km from Hanoi and near the Laotian border. 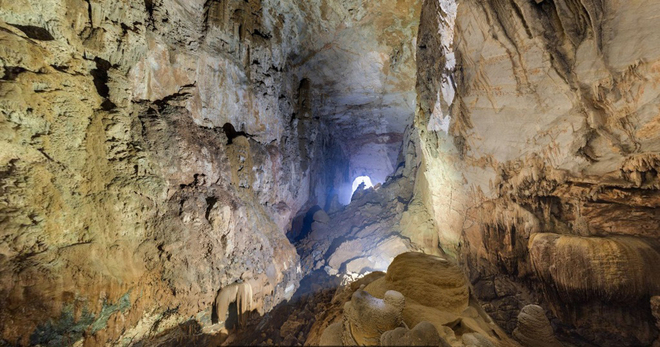 Son Doong cave was found by a man named Ho Khanh, but almost 20 years later, in 2009, it was explored and published by specialists of British Caving Association. Stalactites in a photo like a castle which is located entirely in the cave, about 50 meters high. 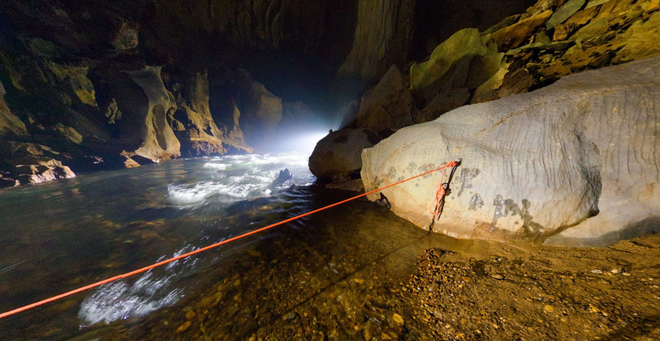 This is a large and fast flowing river through the Son Doong cave. In the rainy season, the river level rises and makes movement through the area impossible. However, the time of the expedition was conducted this image, the river was in low water level so that people can easily pass through. 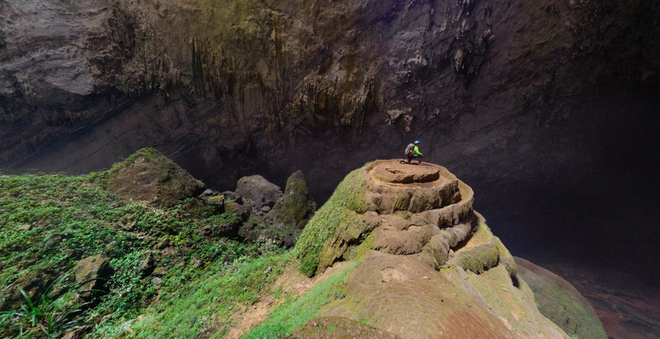 You’re standing on top of a stalagmite called “Hand of Dog” of 70 meters high. It was formed thousands of years. This area is large enough for a Boeing 747 to fly over. 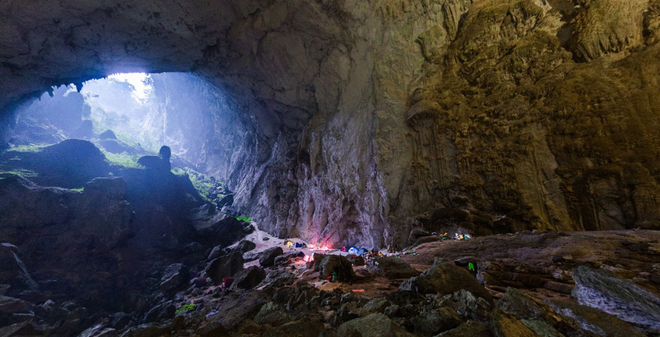 Paying attention to vulnerabilities in the cave ceiling, it makes a difference to the Son Doong cave than the other. 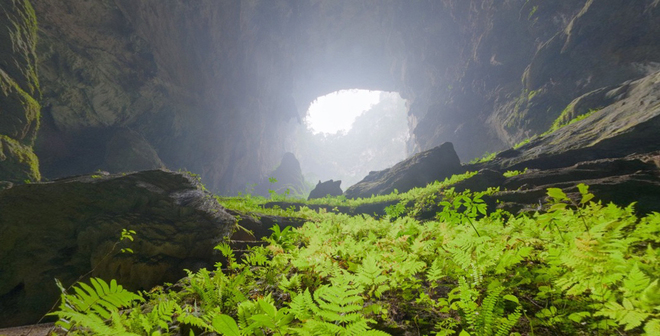 Lights penetrate through the cave and create favorable condition for vegetation growth. Moving forward you will come to Sinkholes 1. 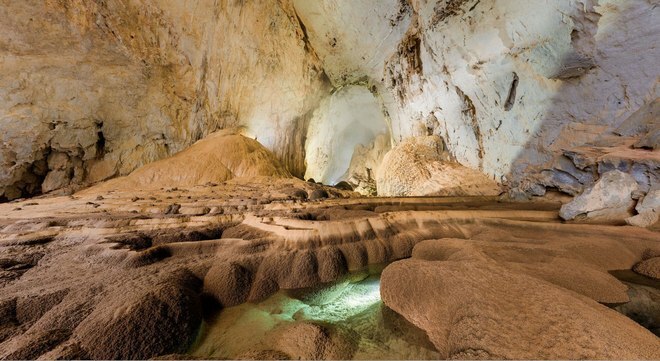 Determining the exact age of the Son Doong cave is a difficult thing. Cave system was formed in a long time and the underground river flowing through has created stunning limestone inside. 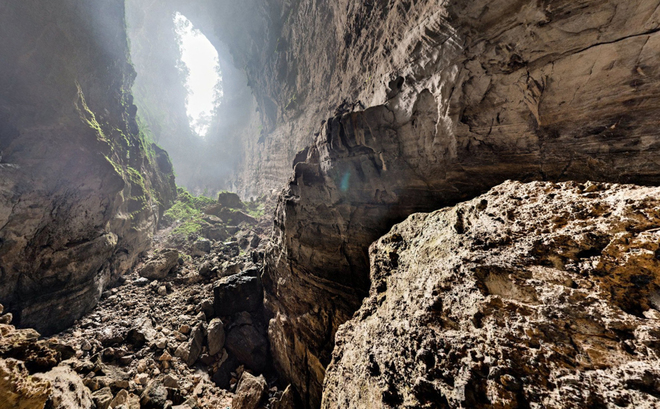 Scientists estimate the cave was formed during the Pliocene geological or late Miocene period. 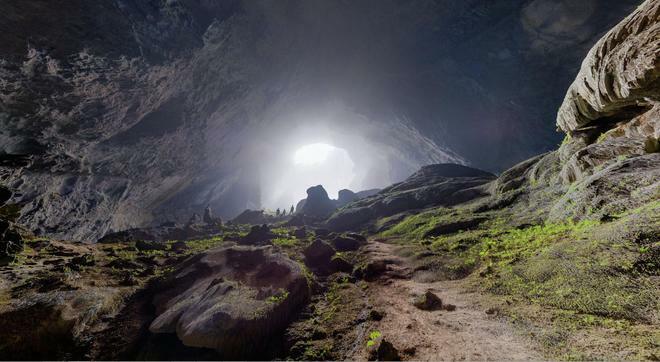 This means that the Son Doong cave is about 2-5 million years old. This area is located between two sinkholes with fossils and water. They are formed by water dripping from the ceiling down. Here are called Phytokarst limestone plains by the explorers. The closer to the light, the more vegetation is expanded. Fern branches seem be inclined 90 degrees toward sunlight. 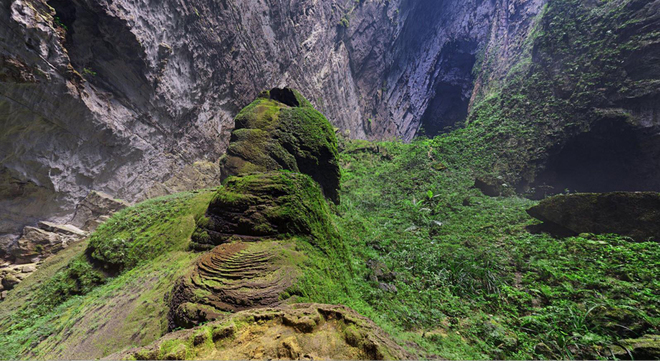 Despite being discovered since 2009, there are not many scientists and explorers reaching Son Doong cave because it is limited in number.